Health and Safety at Work Legislation places responsibility for fire safety on building occupiers and employers and, under the Fire Safety (Workplace) Regulations, the preparation of Fire Risk Assessments is a legal obligation. We have accredited Chartered Building Surveying staff who are experienced in preparation and implementation of Fire Risk Assessments with the aim to identify and eliminate (or reduce) the risk of fire in buildings. 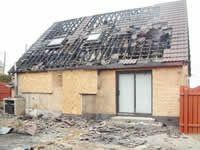 Our service is tailored to suit client’s needs A detailed understanding of the principles of Fire Safety including building forms, means of escape, structural fire resistance and fire safety management, enables us to prepare risk assessments which are specific to the needs of our clients and their premises.